Every successive generation finds fresh reasons for the study of natural law. Current interest in the natural law may well be due to a pervasive moral pessimism in the Western cultural context and wider contemporary geopolitical challenges. Those geopolitical challenges result from two significant and worrisome global developments – unprecedented violent persecution of religious minorities on several continents and a growing climate of secular hostility toward religious faith in Western societies. 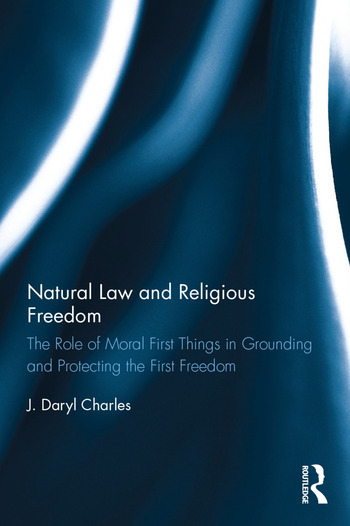 Natural Law and Religious Freedom aims to address what is relatively absent from the literature by demonstrating the importance of natural law ethics in both establishing and preserving basic human rights, of which religious freedom has pride of place. Probing contemporary challenges to natural law thinking that are both internal and external to religious faith, and examining the character and constitution of natural law ethics, Natural Law and Religious Freedom will be of interest to theologians, ethicists and philosophers as well as policy analysts, politicians and activists who are concerned to anchor religious freedom and human rights policy considerations in an enduring way. 4 Second Thoughts on "Pluralism," "Neutrality," and "Tolerance"
J. Daryl Charles serves as a contributing editor to Providence: A Journal of Christianity and American Foreign Policy; is an Affiliated Scholar and faculty member of the John Jay Institute, USA; and is the author, co-author or editor of fourteen books, including (with David D. Corey) The Just War Tradition: An Introduction (ISI Books, 2012), Retrieving the Natural Law: A Return to Moral First Things: (Eerdmans, 2008), Virtue amidst Vice (Sheffield Academic Press, 1997) and most recently (with Mark David Hall), America’s Wars: A Just War Perspective (University of Notre Dame Press, forthcoming). Charles has taught at Taylor University and Union University; was a 2013/14 visiting professor in the honors program at Berry College; and served as a 2007/8 William B. Simon Visiting Fellow in Religion and Public Life at the James Madison Program, Princeton University; and served as a 2003/4 visiting fellow of the Institute for Faith and Religion, Baylor Univerisity. He is a member of the James Madison Society, Princeton University. The focus of Charles’ research and writing is the natural law, the ethics of war and peace, criminal justice ethics, and religion and society. Prior to entering the university classroom, Charles did public policy work in criminal justice in Washington, DC.